Raspberry Linzer Torte is rustically beautiful. The combination of the warm nuttiness of a homemade torte shell with a fresh raspberry filling is absolutely delicious. I’m really excited to bring this Raspberry Linzer Torte recipe to you. This was a recipe from my husband John’s grandmother. My mother-in-law dug it out of her recipe box and said that she had tried it a couple of times and had never been able to get it to come out right. Needless to say, I was a little nervous about giving it a try. If John’s mom wasn’t successful, I wasn’t confident that I would be either. John’s grandmother passed away before I ever met him so I wasn’t able to get any hints from her. My mother-in-law and I don’t think that this recipe came with her from Italy because it’s written in ounces, unlike her original recipes. This torte came out beautifully delicious. I think that my success was the result of measuring the ingredients. We decided that her error was in thinking 9 oz of the grounded almonds equaled one cup in volume. It doesn’t. It is closer to 2-1/2 cups. You can see how that would lead to her failed recipe. I made my own raspberry filling for this torte, but you can use any fruit jam or even a purchased pie filling. 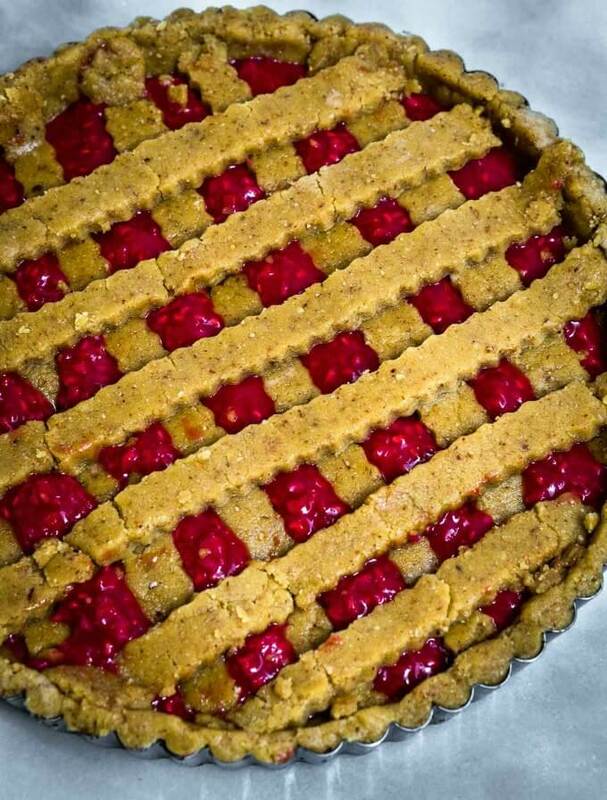 Rustic lattice adds to the beauty of the Linzer torte. A little more than half of the dough is pressed into a lightly greased tart pan. This beautiful golden color is from the egg yolks. Roll the remaining dough and cut it into strips. Lay it crosswise over the filling. Try not to eat more of the dough than you put on the pie (guilty). The strips like to crack. I could have edited those out of my photos, but I didn’t because I think there’s something beautiful about this rustic beauty don’t you think? Cuisinart Mini-Prep Plus Food Processor – This mini food processor is a little workhorse. I grind nuts up or dice up a ton of veggies in no time. I like not having to drag out my full-size food processor for smaller jobs. Microplane Zester Grater – I use this Microplane at least 2-3 times a week. It’s perfect for zesting fruits or burying my spaghetti under a pile of parma! Non-Stick Tart and Quiche Pan with Removable Bottom, 9-Inch – My tarts slip right out of this pan. It’s perfect for tortes, tarts, or quiche. Mini Tart Pans – I love serving everyone their own mini tarts and one is enough for John and me to share. I can wrap up the others and freeze them. Maybe you don’t have time to make it now? Pin it for later! 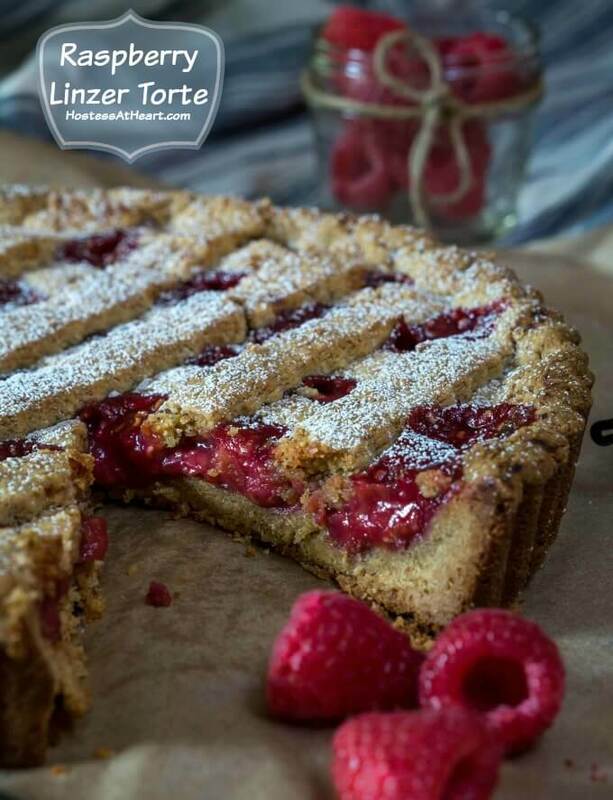 If you LOVE this Raspberry Linzer Torte recipe be sure to leave me a comment and a 5-star rating! HERE ARE A FEW MORE RECIPES THAT I THINK YOU’RE GOING TO LOVE! 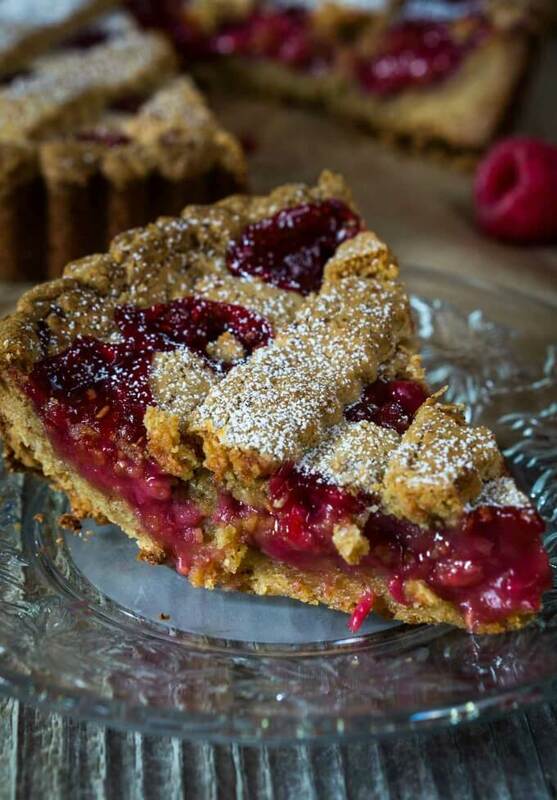 Raspberry Linzer Torte is a rustically beautiful tart that combines the nuttiness of the homemade shell with the freshness of the raspberry filling. In a saucepan, combine raspberries, sugar, salt, lemon juice, zest, and butter. Cook over medium-low heat until berries soften (5 minutes). Stir in flour and cook until thickened (about 2 minutes). Remove from heat and set aside to cool. Preheat oven to 325°F. Lightly grease tart or round cake pan. In the bowl of an electric stand mixer, blend flour and butter together. Add powdered sugar and almonds and blend until combined. Add egg yolks and vanilla and blend until combined. Take a little more than half of the dough and press it into an 8 or 9-inch tart pan or round cake pan. Spread the filling (or jam) over the dough. Press the remaining dough between two pieces of waxed paper or plastic wrap. Roll flat and cut into strips. A pizza or ravioli cutter works great but a knife will work too. Lie strips crosswise over the filling. Bake slowly for 50 to 60 minutes. If shell starts getting to brown cover the edges with foil. Sift additional powdered sugar over the top. If you aren't making your own filling, use 1/2 pint of fruit jam or ready made pie filling. How much flour do you use to thicken the filling? Oops Sharon thank you for bringing this to my attention! I stir in 2 tablespoons a little at a time until it’s thickened. Thank you, Linda! I’m glad it came out because the pressure was on! I’m glad you perfected John’s grandmother’s torte. Looks delicious Julie and thanks for sharing with FF! Me too Judi! I really loved that almond shell. It was delicious. Thank you Mara! I actually just got them a little over a year ago and am treasuring them. Wow, this is gorgeous! I’m so glad that it worked out for you and that you figured out the mistake in the recipe. How lovely to be able to bring lovely memories back to you husband and mother-in-law! It looks so good, raspberry jam is one of my favourite kinds so this sounds delicious and the red of the raspberries is stunning. Thanks for sharing it – it makes me wish I was somewhat good at baking! Thank you so much Maggie! Such kind comments, and I really loved sharing this torte with them. I never realized that not everyone thought of themselves as a baker, but I’ve learned that’s a fact. If you ever have any questions let me know and we’ll turn you into a baker yet! Thanks, Julie! My sister and her husband are going to give me some lessons. I can do no-bake things like ice-cream cake and refrigerator cake but that’s my limit! That will be a lot of fun Maggie! I’ve done a few lessons myself and taught a few too. It’s always fun! You make food an art form. Beautiful, once again! Just beautiful Julie. I especially love that tart shell, those crushed almonds surely played a great role in the taste? You’re really going to town with your baked goods eh? They all look so scrumptious! Thank you Loretta. This tart and the shell is old world delicious. My mother-in-law tried it twice and quit because of all of the almonds going to waste when it didn’t work out. I’ve really had a great time baking. I love doing it, and it almost seems like that’s what people want me to do? I love seeing all kinds of recipes from everyone else, but I guess that’s why we enjoy so many blogs right? Thank you so much Marisa! I would love to have met her and shared her old world secrets. I love the few recipes that I have from her. I’ve never made a dough like that before. It’s a gorgeous color, and I’ll bet it’ s delicious. I’d also guess that it’d be as delicious wih a cherry filling as it probably is with this raspberry one. Nice work! Thank you Jeff! It would be delicious with cherry too. The dough is pretty hard to quit munching on once you allow yourself to start. John’s grandmother would have said you were the perfect granddaugher-in-law! Linzers are my favorite cookies and I know I would love this rustic beauty. Fantastic photos Julie! Thank you so much, Johanne! I just loved sharing it with my in-laws. It was like a memory from the past visited them. Thank you so much, Jess! I really enjoyed making this tart and so happy that it came out! Phew! !